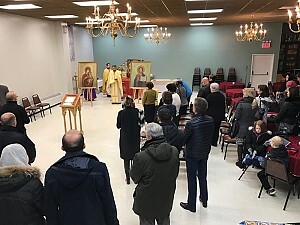 On Thursday, March 9th, parishioners from St George Serbian Orthodox Church in North Canton traveled to New York City for their second-annual Lenten Pilgrimage. The travelers began their experience with a visit to the Cloisters Museum, part of the Metropolitan Museum of Art. The Cloisters is a medieval monastery transferred to New York City and, since its re-assembly, houses an incredible collection of medieval art, as well as Christian icons, paintings and artifacts. During the visit, Fr. Aleksa pulled aside the four youngest pilgrims and asked them to discuss the icon of the Nativity. Together, they compared and contrasted a western iconographic depiction of the Feast of the Nativity with the icon of the Nativity with which the children were familiar. Later in the afternoon, the pilgrims visited St. Vladimir’s Seminary where they were warmly greeted by Matushka Robyn Hatrack, the Events, Alumni, and Hospitality Director. She escorted them to the seminary chapel for their seminar presentation offered by the Very Reverend Alexander Rentel, Director of the Master of Divinity Program, Ecclesiarch, Assistant Professor of Canon Law and Byzantine Studies, The John and Paraskeva Skvir Lecturer in Practical Theology. Fr Alexander’s talk started with the mission and purpose of St. Vladimir’s Seminary. While reflecting on the seminary’s rich tradition, he posited that it is in church where we become who we are truly meant to be in Christ. He then offered a wonderful discussion on the Orthodox practice of fasting, focusing his discussion on the spirit behind the fast. Utilizing a great deal of Scripture, both Old and New Testament, Fr. Alexander’s presentation was both practical and accessible. Following the presentation, the pilgrims enjoyed a tour of St. Vladimir’s Seminary offered by Sister Margarite, an M.Th student from Holy Assumption Monastery in Calistoga, California. 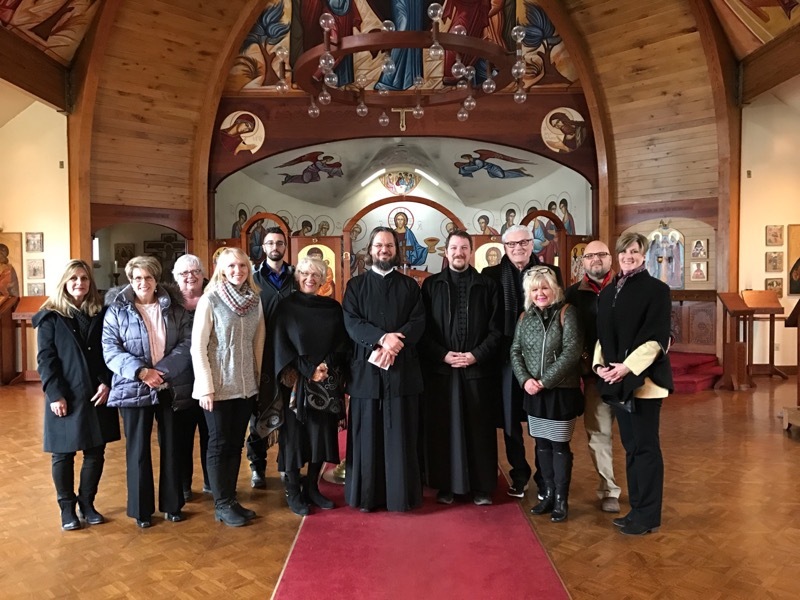 During the tour, Deacon Larry Soper, current M.Div student at St. Vladimir’s and member of the Serbian Eastern Diocese via St. George in North Canton, joined members of his old church family. All were overjoyed to see both him and his wife Diakonica Adrienne, as the two of them departed the community for St. Vladimir’s many months ago. Sister Margarite was engaging and knowledgable, and one of the many highlights of the group’s visit to St. Vladimir’s. The first day concluded with a meal and fellowship in the seminary refectory where students, staff and pilgrims were able to interact socially. One student remarked that it was incredibly meaningful for people to support the seminary by visiting and spending time with the students. He elaborated, explaining that when students get caught up in the rigorous and challenging life of the seminary, any visitors serve as a wonderful reminder that there are real communities and faithful people praying for them. On Saturday, the many participating families arranged cultural, spiritual, and artistic excursions to enrich those traveling with them. A number of parishioners visited the 9/11 memorial to offer prayers for those lost in the terrorist attacks in 2001; some sought out, and found, the names of their earliest Serbian immigrant family members who travelled to America; others visited various museums, like the Tenement Museum on the Lower East Side and the Museum of Modern Art, current home to a traveling exhibition on 20th century Russian Art and permanent home to a number of famous pieces including Van Gogh’s “Starry Night”. Many of the pilgrims were able to enjoy a meal with the Very Rev. Stavrophor Zivojin Jakoljevic before returning to their hotel for the evening. On Sunday, March 12th, the pilgrims joined the St. Sava Serbian Orthodox Community of New York for Divine Liturgy at St. Eleftharios Greek Orthodox Church in Manhattan. Concelebrating priests were Fr Zivojin Jakovljevic, Dean of the Pro-Cathedral and Episcopal Deputy; Fr Vladislav Radujkovic, Second Priest of the Pro-Cathedral, and Fr Aleksa Pavichevich, Parish Priest of St George Serbian Orthodox Church. During Divine Liturgy, Fr Zivojin offered an inspiring homily on the blessings bestowed upon those who strive to imitate the Saints. Reaching into the Old Testament with figures such as Moses and Elijah, into today’s Gospel about the healing of the Paralytic, and then into the lives of the Saints, Fr Zivojin wove a tapestry of God’s miraculous works through those who dedicated their lives to the service of our Lord. The pilgrims of St. George returned to their home communities on Sunday, spiritually refreshed and strengthened for the Lenten journey ahead.